When addressing the empowerment of adolescent girls, we recognize that we must engage boys and men in the process. Boys and men can play a positive role in ensuring that girls have access to sport programmes and leadership positions and are able to make their own decisions about their bodies and future. It has become evident that finding a way to engage with boys and men is a necessary part of the efforts to improve the status of women and girls.1 The vulnerabilities and disadvantages that adolescent girls face are often due to social constructions that determine identities, roles, behaviours, and social structures. By addressing these social stereotypes, with girls as well as boys, sport programmes can take a holistic approach to creating social structures that empower girls and do not alienate or exclude the boys. In fact, excluding boys from programmes, particularly in places where there are few opportunities for either gender to play or join a sport team, could sometimes cause jealousy among the boys and could lead to increased aggression. Teaching boys how girls are disempowered and how their own exercise of traditional norms around masculinity often contributes to gender-based violence (GBV) is good for everyone. Restrictive gender stereotypes can also hurt boys themselves, setting them up for failure in difficult economic or conflict situations if they do not live up to traditional gender norms or societal views of what a man must be or provide. The opinions and behaviours of boys often impact significantly the girls they call sisters, girlfriends, and neighbours, now and in the future. Girls in adolescence often overvalue the opinions of their male peers. If boys like a girls’ sport programme and become allies of it, they are less likely to demean or challenge a girl’s participation. If they feel threatened or excluded, teasing and harassment by boys in the community could reduce the number of girls who want to participate, as well as diminish the self-confidence of girls participating in the programme. On the contrary, inviting a boys’ team to come and support girls at a game or event can be a powerful statement and affirm a girl’s participation in the programme. In addition, seeking the support and help of older males, such as fathers, brothers, relatives, or other community members, when implementing a sport programme can help your organisation reach its objectives through a holistic and sustainable approach. You gain valuable advocates and important allies who work with you to change existing social stereotypes, gender roles, and societal constructions, from which women’s disempowerment and vulnerability to GBV has emerged. You are creating an atmosphere that fosters working with, not against, men to create more equitable relationships between males and females. Engage boys in the program by planning tournaments where both girls and boys play (for more information, go to the Mixing Genders section of this guide). Create a system in which boys can be allies of the programme and help sisters and girls with chores at home. Partner with other sport and development programmes that work with boys and offer to do tournaments or exchanges with them. Encourage girl leaders and coaches to organise and coach groups of boys. This will create a space where boys can play too and one that challenges traditional gender roles. Encourage fathers or male caregivers to come to programme meetings. Oftentimes, mothers or female caregivers take on the responsibilities of meeting with teachers and sport coaches, and are the ones showing up to all the meetings. When a male caregiver does show up, have him introduce himself and give him special recognition. Create a committee of male caregivers whose daughters are involved in the programme. Have these males strategise ways they could reach out to other males and institutions in the community to help promote their daughters’ right to play as well as their rights in general. Examples could include meeting with influential groups in the community normally not accessible to women or gathering large crowds of supporters when there are matches or tournaments. Involve males in organising tournaments or community events. Promote ideas of women and men working side by side for a common cause. Engage the boys in girls’ lives when making the case for girls’ sport programmes. Brothers, potential boyfriends, or male peers can be the biggest accelerators of a girl’s right to play or the greatest inhibitors. Hold meetings or attend boys’ tournaments and describe why girls’ sport is good for the community and how it could be good for them as well. Partner with groups that engage both girls and boys and men. For example, dance troupes are often mixed and are acceptable in most communities; this can be used as a demonstration of positive engagement. In the Naz Foundation’s Goal programme, girl Goal Champions lead select life skills sessions as well as teach netball skills to boys who would hang around during the girls’ practices. Kalyani Subramanyam, who runs the programme, realised that the boys wanted to know how to play netball because it was something new to them, netball being traditionally a girls’ game. Kalyani used girls in her programmes who were leaders to teach those boys how to play netball and lead them through selected life skills sessions as well. The ICRW conducted a programme in Mumbai, India, called Parivartan, which engaged cricket coaches and mentors in schools and the community to teach boys lessons about controlling aggression, preventing violence, and promoting respect. The programme used peer-to-peer education as well, engaging young cricket captains to act as role models and educate their teammates on GBV and positive behaviours. MIFUMI uses karate and tae kwon do to educate girls about domestic violence and empower them physically and emotionally against it. When the programme began, Project Coordinator Janet Otte reported that boys were physically attacking girls on their way home from training. They were uneducated in martial arts and wanted to show the girls that they, too, could fight. Janet made the decision to include boys occasionally to educate them about the non-violent principles of martial arts to help keep girls safe. At Boxgirls boys are invited to train with the girls from time to time. Gym space is limited in the slum. Priest, the leader of the programme, often has a more experienced female boxer instruct a less experienced, younger male boxer. This encourages the boy’s respect for the girl’s mental and physical skill, while building the girl’s confidence in herself and her abilities. 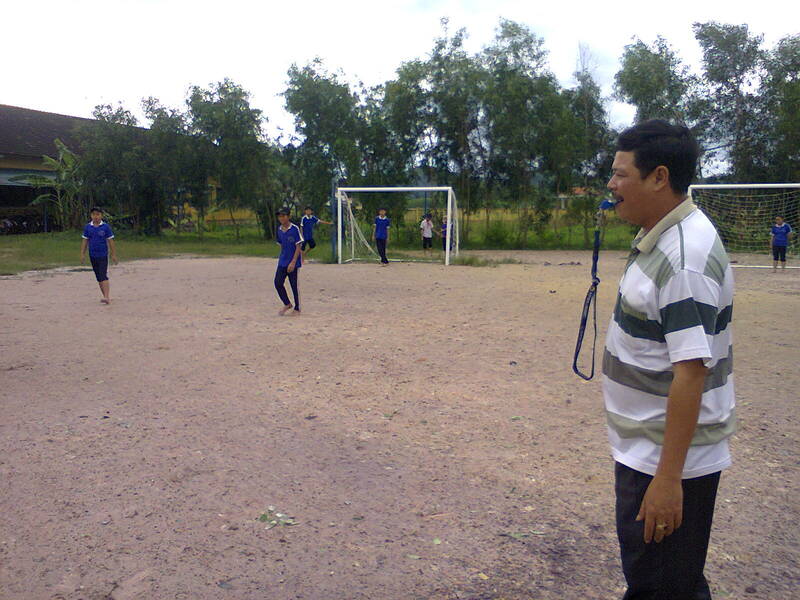 Football for All Vietnam (FFAV), a grassroots football for development organisation based in Hue City, actively seeks out and relies on volunteers from the community to act as referees, coaches, and club managers for their football activities, which are always 50% girls and 50% boys. This allows the organisation to engage boys and men, and get them on board with girls’ football, in communities throughout Vietnam. These volunteers go back into the community and act as advocates for the girls. For a personal story of one dedicated volunteer, Mr Nguyen Van Xuan, check out the web article: FFAV's Companion. PROMUNDO. 2008 “Engaging Men at the Community Level” The ACQUIRE Project/EngenderHealth and Promundo. What pages do you want to include in your PDF? To contribute your story, photo, document, or video, register or login. It's easy and free!